We have been rehearsing our Original music every chance we get. 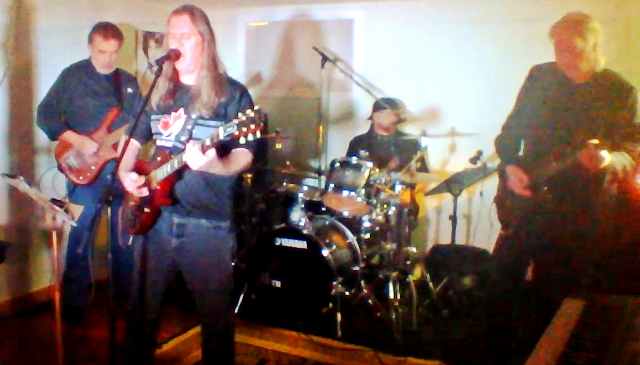 From Within was formed after Steve Hutchinson and Bill Goldie started working together on writing original music. The other members Al and Sam joined in after the pair had decided to push forward with their dream of producing a classic metal album. It had always been on one of their life’s to do list but somehow it never seemed to materialize in their previous bands. All four had played in several cover bands throughout the years but never really worked on original material. It took a more serious turn once Steve and Bill started putting the songs together and with Bill’s studio(Labyrinth Sound) now complete recording them became the next logical step. There are a variety of influences that come together to form their sound. Some would say that their sound goes back to the beginning of Metal roots. Of course there was no classification for Metal back then. It was considered to be Hard Rock. The writing has a hint of Pink Floyd and the composition breaths of Black Sabbath Deep Purple and Uriah Heep. Some of their tunes have hints of Iron Maiden and Alice in Chains. Unfortunately after recording the final tracks of the Album Sam decided to hang up the sticks for good. Bill and Steve did not want to see all of the hard work and dreams of finally releasing an album die so they completed the CD GHOSTMAN and it was released digitally on October 14 2018.